Clinical Documentation Strategies for Home Health is the go-to resource features home health clinical documentation strategies to help agencies provide quality patient care and easily achieve regulatory compliance. Are you looking for training assistance to help your homecare staff enhance their patient assessment documentation skills? 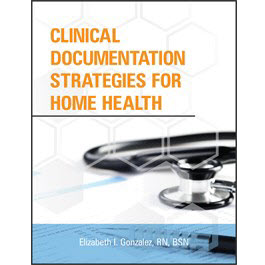 Look no further than Clinical Documentation Strategies for Home Health. 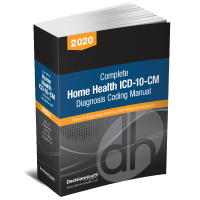 This comprehensive resource covers everything homecare providers need to know regarding documentation best practices, including education for staff training, guidance for implementing accurate patient assessment documentation, tips to minimize legal risks, steps to develop foolproof auditing and documentation systems, and assistance with quality assurance and performance improvement (QAPI) management. Elizabeth I. Gonzalez, RN, BSN, is the director of patient care services and assistant administrator at Accent Care Texas Home Health. She has over 30 years’ nursing experience with 20 years in the home health care field of nursing. Her previous roles within home health have been as field nurse, clinical manager, director of patient care services, and assistant administrator. Gonzalez earned her bachelor of science in nursing from the University of Texas at El Paso. She also holds a certificate of completion in business administration. Gonzalez is also a member of Sigma Theta Tau International Honor Society for Nursing. She has been dedicated to the profession of nursing since 1983. She is committed to the nursing culture of excellence, the value of pride and professionalism, and quality outcomes and collaborative practice with patient- and family-centered care.